In the following, you’ll find a handful of select radios I recommend for the 2013-2014 gift-giving season. I’ve arranged this selection by price, starting with the most affordable. Updated for the 2013-14 holiday season on 08 December 2013. You can’t buy a lot for $30 US these days, but I’m here to tell you that you can buy a unique, portable AM/FM/shortwave radio with a built-in MP3 player called the ShouYu SY-X5. I made a full review of the SY-X5 earlier this year; in short, it surprised me. While this little radio’s receiver can’t compare to the others on this page performance-wise, it is still very respectable. The MP3 capability is worth the price. 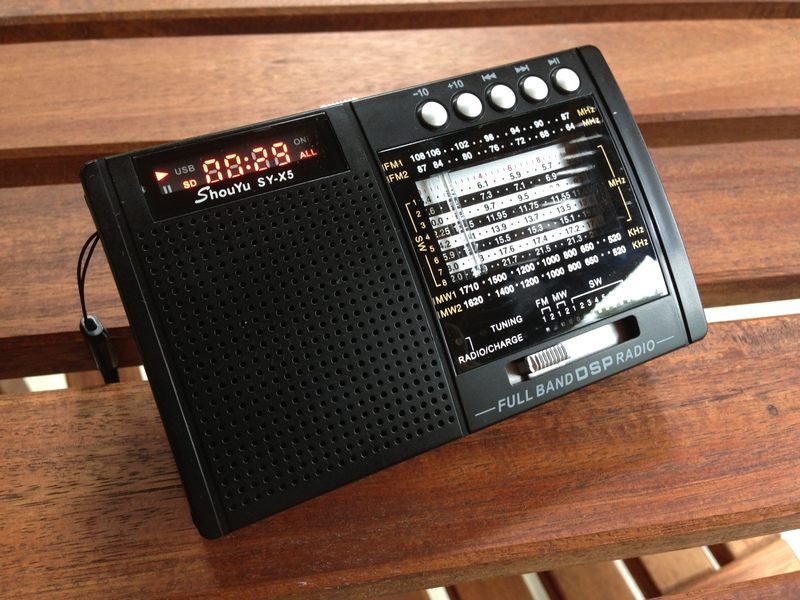 You can load a microSD card full of your favorite music (or shortwave radio recordings) for days of listening! Indeed, the audio from the built-in speaker is superb for a radio this size. Th SY-X5 can be powered from multiple sources (a rechargeable built-in battery pack, AA batteries, or via USB power cable). Since the ShouYu SY-X5 is only available from eBay sellers in Hong Kong, you need to allow at least two or three weeks shipment time from the seller. You might ask if they offer an expedited option. Click here to search eBay for the ShouYu SY-X5. Other considerations include the Degen DE32 (review here) or Degen DE321 (review here). Note that the Degen DE321 lacks an MP3 player. In each issue of the holiday guide, I like to feature at least one self-powered radio. Why? Because if you’re ever been left in the dark due to a natural disaster or extended power outage, these radios become invaluable. 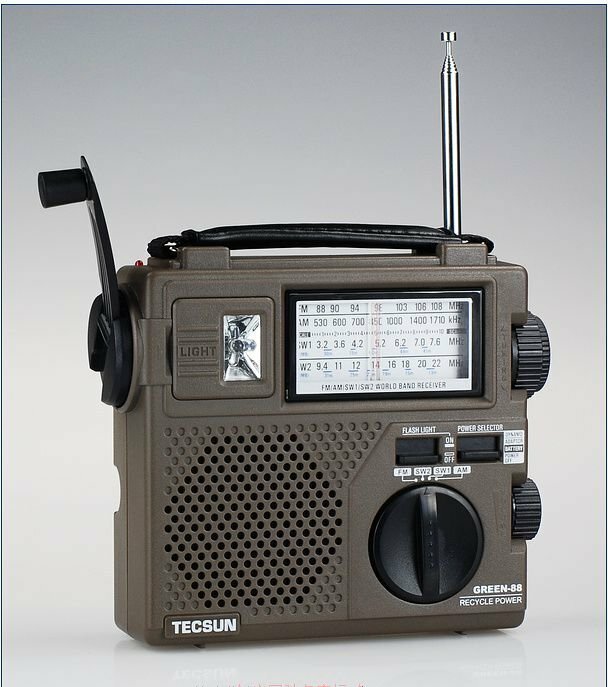 The Tecsun Green 88 is not only self-powered, but quite a capable little analog shortwave radio. It has a nested fine tuning control on the tuning knob, an easy to read display and will give you about 40 minutes of listening time (at moderate volume levels) from two minutes of cranking. The LED lamp on the front makes an excellent flashlight and reading lamp. Again, to my knowledge, this radio is only available from sellers in Hong Kong on eBay, so allow extra shipping time. 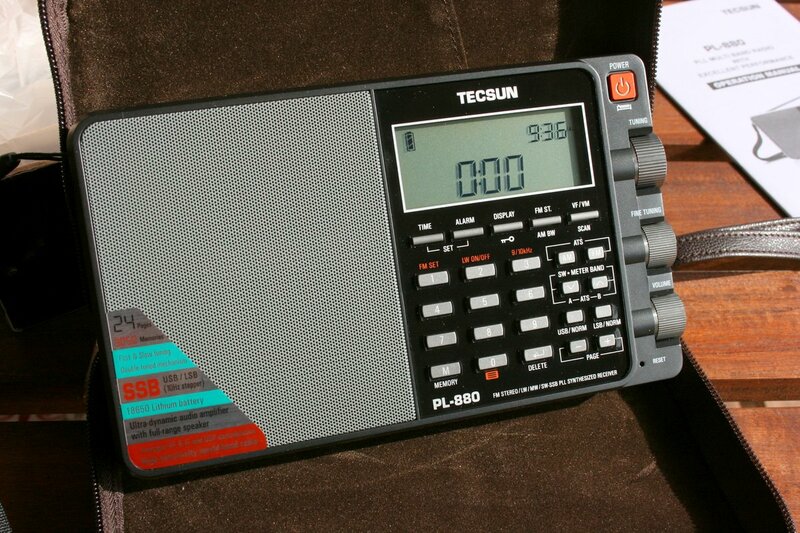 Click here to search eBay for the Tecsun Green 88. Some other self-powered radio options you might consider are the Eton Rover and the Eton FRX2, though note that they both have NOAA weather radio channels instead of shortwave. A very useful feature, though, for weathering winter storms. With the introduction of the new Tecsun PL-880 this year, retailers have dropped the price of the PL-660; you can now find them between $100-110 US. The PL-660 is an all-around excellent receiver with great sensitivity, selectivity and all of the features to please a casual listener or the experienced DXer. For a full-featured radio, the operation is so simple an owner’s manual is barely needed. The PL-660 covers the entire shortwave radio spectrum, LW, AM (medium wave), FM and even has an AIR band (to monitor aircraft communications). If you would like to see and hear the PL-880 in action, simply click on this link and explore the numerous posts and comments. In short: it’s a great radio with superb audio from the built-in speaker. It’s also designed to make the amateur radio operator happy as it has an array of filter selections for the ham bands. In my experience, the selectivity and sensitivity are on par with the PL-660 (mentioned above). Click here to read a full review of the PL-880. The CommRadio CR-1 is sure to please even the most discriminating radio listener in your life. 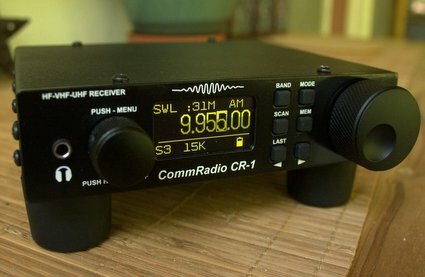 The CommRadio CR-1 was introduced early this year and began shipping in the Spring. While you can read my full review of the CR-1 by clicking here, in a nutshell, it’s a brilliant little receiver! It wooed me from the moment I first saw it. The CR-1 is made in Colorado, USA by CommRadio, a company well-versed in radio avionics. It’s thoughtfully engineered, relatively small (über portable), and meets all of my performance needs. It’s also a fun little radio and very easy to operate. The CR-1 can be updated by the user via a USB cable and free PC software. Many of the updates include minor tweaks requested by users and even new features. Only one catch: CommRadio has sold out of their stock for the holiday season. They’re offering a $25 coupon (see below) if you order and don’t mind an early January delivery time. 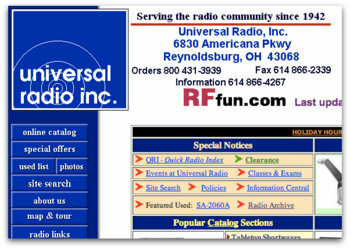 However, call Universal Radio as they had radios in stock at time of this posting. Other tabletop radios to consider are the Alinco DX-R8 and the Icom R-75. 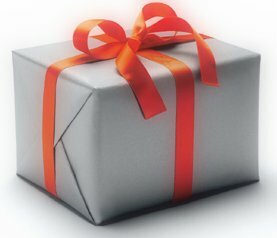 Want more gift options? Try our 2012, 2011 or 2010 gift guides, take a look through our shortwave radio reviews guide and/or our simplified reviews page. 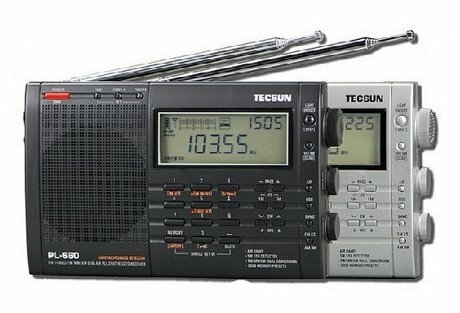 This entry was posted in Emergency Preparedness, Radio Gift Guide, Radios, Reviews and tagged 2013 Shortwave Radio Gift Guide, CommRadio CR-1, Shortwave Radio Christmas Gifts, Shortwave Radio Gift Guide, ShouYu SY-X5, tecsun green-88, Tecsun PL-660, Tecsun PL-880 on December 8, 2013 by Thomas. I just posted this and bought 5 of them. Thanks so much. Best deal I’ve ever seen for a sel-powered radio.